The firm worked with Organschi’s Aaron Schiller of Schiller Projects to develop the Chilmark House, Schiller’s family compound in Martha’s Vineyard. Historically, architects have been Renaissance men. Yet today, the profession prefers its members to be specialists. The polymath who once drew on all her knowledge to craft a space is now supposed to be a leading expert in one esoterica or another. Architects Lisa Gray and Alan Organschi stand firmly against this narrowing trend. The New Haven-based architects met at Yale in 1986, married in 1991 and launched their eponymous firm in 1997. “We bonded around the idea that architecture is this grand humanistic experiment that could test everything from science to literature,” Organschi says of the mutual attraction that binds he and Gray both professionally and personally. 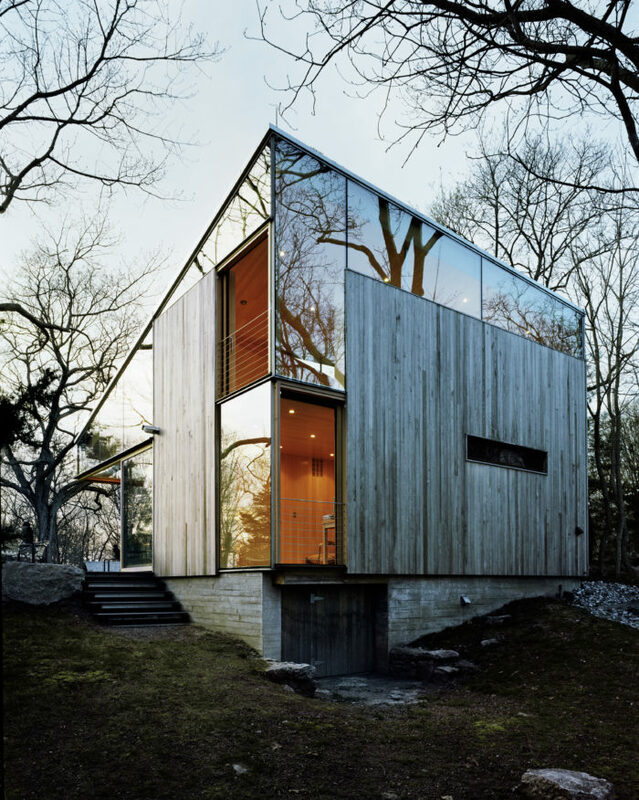 Photograph originally taken for Dwell Magazine of a modern cottage in Connecticut built for an older couple. Home designed by Gray Organschi Architecture. In its early days, Gray Organschi Architecture mainly focused on the residential commissions that keep most new studios afloat, relying on their own deep-seated skills. Indeed, intimate knowledge of materiality and fabrication has vitally informed the Gray Organschi design process. In 2005, the architects devised a prefabricated setup for a house overlooking Seal Cove in Maine to minimize disruption of the rugged coastal site. Six years later, in Guilford, Connecticut, they melded multiple structural systems into a 1,000-square-foot cottage, the geometry of which is more jewel than box. The studio has enthusiastically continued expanding into new project types and methods. 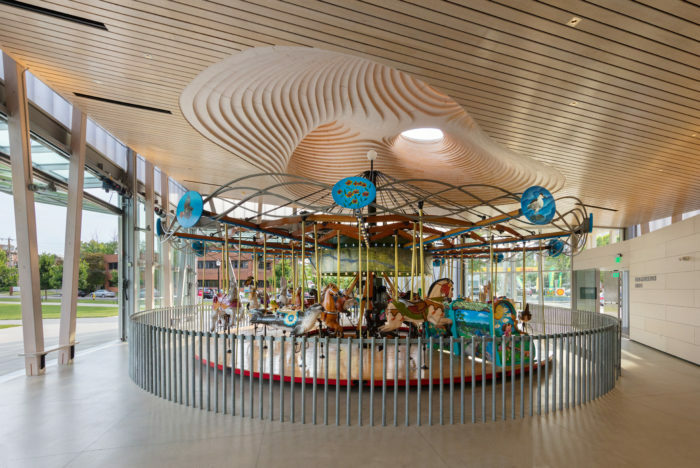 In 2003, Gray and Organschi volunteered to design and manage construction on a much-needed addition to their kids’ daycare facility and since wrapping that year-long project, the firm has completed multiple learning environments. Around the time of that first educational project, the couple also turned their attention to what Organschi calls the contradictions of contemporary sustainable practice—“the net-zero suburban house is an incredibly conflicted idea; cities are efficient spatially but use energy-inefficient materials”—and today they passionately advocate for timber structural systems as a carbon-sequestering, job- creating method for building denser cities. And in yet another example of constantly seeking new challenges, footbridges have become something of a brand expertise, too. It’s not unusual for these varied long-term experiments to converge in a single stroke. For a home they just completed in Guilford, the pair combined decades of residential experience with environmental stewardship to dismantle a 1970s-era house already standing on the coastal site and improve upon the original design’s relationship to the shoreline. The firm then rebuilt the scheme using the salvaged materials. Meanwhile, Gray Organschi’s latest education effort, Common Ground High School in New Haven, is one of the first cross-laminated timber—a pre-fab process that is low-impact and thoughtfully designed—structures in America.